Give your bathroom a new shining look with these 10 must have accessories, which are also essential in every luxury bathroom. You probably haven´t realised yet that bathrooms usually have lots of accessories. From soap jars, to towel racks and furniture, the list could be endless. Given the nature behind bathrooms, those accessories must be, first of all, functional, since there’s usually not that much room for purely decorative objects. Especially if we are talking about small bathrooms. However, small or huge bathrooms can have a modern look with the right choice of accessories. Take a look at the following ideas. What bathroom doesn’t have a mirror? Mirrors are basically the most common accessory for bathrooms, regardless its size and design. Mirrors come in all sorts of shapes and sizes. They vary from small models to large ones, from round to square and hexagonal and they can sometimes also feature more unusual designs, meant to impress and to stand out. Take a look at the stunning Venice Mirror by Boca do Lobo. It’s stunning! In certain cases, a side table can be a wonderful addition next to the tub. Perfect for those relaxing long baths, in which you enjoy a glass of wine. My suggestion is this unique Koi Side Table by BRABBU. 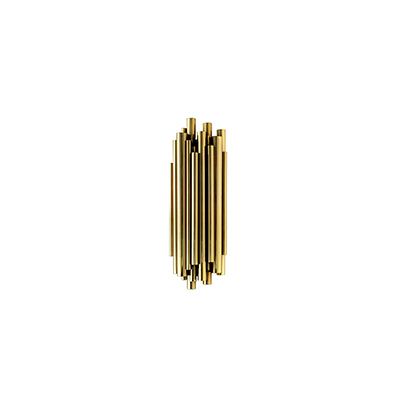 Take a look at this Passion Sconce by KOKET. It gives your bathrooms a modern and romantic style inspired by nature. These towel racks are very useful to hold your towels. And the best thing is that you can move them to anywhere they suit better, anytime you want. Take a look at these two models by Maison Valentina: Diamond and Eden. For a completely unique and modern style and a totally luxury twist, you have this Newton Washbasin by Maison Valentina. Combining with the washbasin, we have Newton Bathtub also by Maison Valentina. Luxury Bathrooms is completely in love with this collection, so please meet the last Newton piece: Newton Freestand by Maison Valentina to complete the setting. A stylish silver tray can be used as both a decorative and practical accessory. And they give a posh and chic look into any bathroom, such as the following example. Towels baskets are very practical and they also give the bathroom a more welcoming feeling. At last, it’s still missing a fundamental accessory for all bathrooms: soap dispensers. A beautiful soap and lotion dispenser always adds a nice touch to a bathroom. Luxury Bathrooms hopes you feel truly inspired with the last 10 suggestions of must-have accessories for bathrooms. If you any other excellent suggestion, feel free to leave a comment above or send us a message.